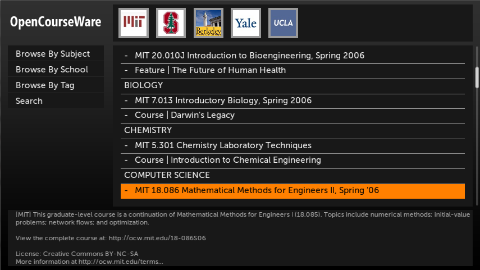 OpenCourseWare is an MIT initiative to share educational course material freely over the Internet. OpenCourseWare has now been adopted by many more universities in the US and across the world. The OpenCourseWare Boxee app brings together complete video courses from MIT, Yale, Stanford, Berkeley and UCLA. This app was developed as part of the Boxee Developer Challenge and won the judges choice for best video application. Download boxee and install OpenCourseWare from the apps section. 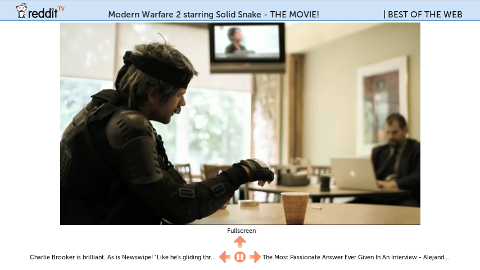 RedditTV Features the best videos on the web as voted up by the reddit community. The boxee app sources videos from reddit.tv (developed by another reddit enthusiast). The new version lets you toggle between full screen and a smaller view and skip back and forth between videos. Download boxee and install redditTV for hours of entertainment.